With right cookware and method, you can make a serious dish which could taste as good or even better than stove-top cooking. 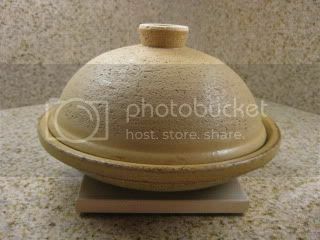 Donabe Steam-Roaster, "Tochinsai", is indeed a brilliant cooking microwavable cooking tool, and it's also been very popular among serious foodies who are often too busy to cook too elaborate recipes. 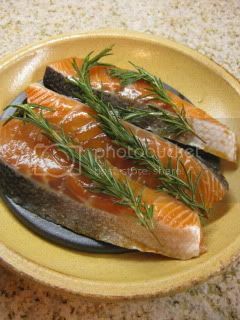 When I'm busy, Tochinsai saves my time, and this steam-roasted soy rosemary salmon is one of my favorite busy day recipes lately. You just need the short time to marinade and cook. The additional bonus is (just like other donabe) you can serve it right out of the donabe at the table. It makes a beautiful presentation. 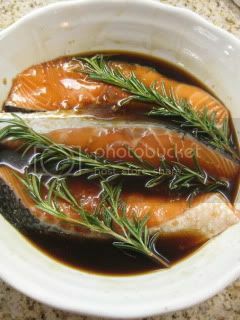 First, marinade salmon filets in sake-soy based sauce with rosemary for 30 minutes. Then, set the filets with rosemary in Tochinsai. Cover and cook for about 3 minutes in microwave (700-watt power). That's really it! 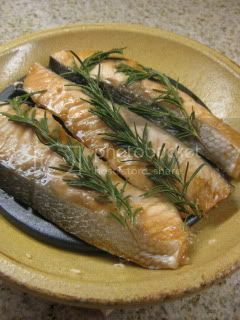 And the salmon is so fluffy with very nice flavors of mild rosemary and soy. Excess grease falls to the bottom from the grate, so the fish doesn't smell or taste greasy at all. I just need a bowl of donabe rice to complete a meal. Very happy. You can find the recipe on toiro's website. Please check it out.